What sport do you play with four people, ping pong paddles and a whiffle ball on a mini tennis court? 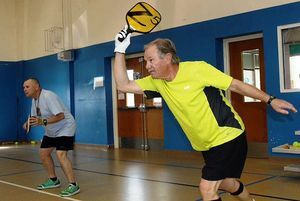 Reported to be the fastest growing sport in the country, pickleball has its own following in Dare County. Three days a week, a group of dedicated players can be found inside the gym “Rec Park” in Kill Devil Hills. Played like tennis, there are serves, aces, volleys, smashes and dink shots. Pickleball even has its own scoring. Players wear court shoes, quick dry shirts, sweatbands and even gloves. The graphite paddles look like ping pong paddles on steroids. Although it’s not offered by Dare County (NC) Parks and Recreation, leisure services supervisor Charlotte Midgett says they make the gym available to these mostly older adults to play this high-activity game.